I love food. Breakfast is especially awesome, because it comes right after my morning run when I’m extremely hungry and after scarfing down a banana and a glass of milk am still eager for more sustenance. 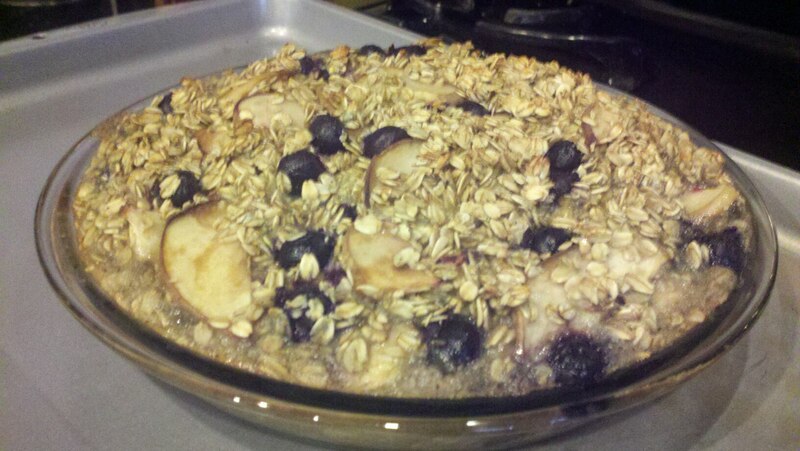 For the past two weeks I’ve been on a roll eating baked blueberry peach oatmeal, making it in one big batch on Sundays and then making my way through it during the week. It’s filling, fruity, and a great hot breakfast before heading off to work. I’ll admit I didn’t invent the recipe, but I did de-glutenize it and thought I’d share it here since I’m mildly obsessed with this stuff at the moment. The big bowl of deliciousness has just arrived from the oven! Add the oats, brown sugar, baking powder and salt to a large bowl, and stir with a fork until combined. Be sure to break up those brown sugar chunks! Set that aside, and in another bowl whisk the egg whites, full egg, milk, oil and vanilla. Add the wet ingredients to the dry, and stir until well blended. Set aside. Whip out those peaches and cut them into thin slices. Wait until now to do this step, because the oats mixture needs to set for about 5 minutes to soften. Pour those peaches and all of their godly golden juiciness into the bowl. Add the blueberries and stir. The recipe says to use an 11x7in baking dish, but I use this glass pie pan that’s about 10 inches in diameter and it works just fine. Really use whatever you want, just be careful of (in my case) a little leakage. I just put it on top of a cookie sheet and everyone is happy. Anyway, add the contents to your favorite baking container and bake uncovered at 350° for 35-40 minutes, or until the top is starting to turn golden brown. Serve immediately, though this stuff refrigerates and re-heats very well! You can serve it with milk! Makes about 9 servings (or if you’re a running pig like me, 7).